Successfully Added 13.3 Inch DVD Player - 1200x800 Resolution, Region Free, Copy Function, Game Emulation, Hitachi lens to your Shopping Cart. 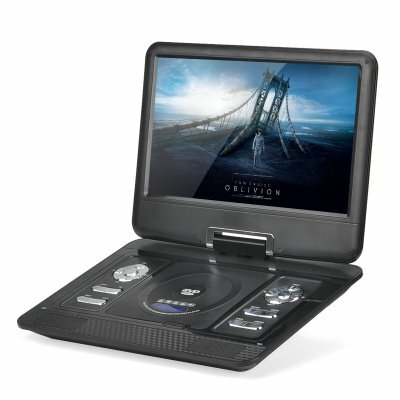 Enjoy your movies anytime anyplace with this fantastic portable 13.3 inch DVD player. Featuring a 13.3 inch high definition TFT LCD screen this light weight portable DVD player will bring you a great viewing experience with its 270 degree rotational screen that can be adjusted to the best viewing angle. A built in 1800mAh battery lets you indulge in around 2 hours of viewing, with all major formats and most disc types supported (including DVD, CD, EVD, VCD, CD-RW, DVD-R ) there's no limit to your entertainment. The player is region free so no matter where your discs were encoded this player will have no problem playing them. As this portable DVD play has stereo speakers you will be provided with a quality sound and can listen freely to your musical CD's or load music via the micro SD card slot and the MP3 support allows you to store up to 10 times more audio on a single CD without any noticeable degradation to the quality. With a Hitachi lens and anti shock you will enjoy beautiful video in high definition on this quality portable DVD player without any interruptions as the DVD player reads ahead and can compensate for any bumps of knocks that would otherwise disturb the playing process, this makes it ideal for long trips. A great way to entertain the kids on those car, train or plane journeys and with classic arcade game emulation if you run out of movies there's still plenty to do. This 13.3 inch portable DVD player comes with a 12 months warranty, brought to you by the leader in electronic devices as well as wholesale DVD players..